Do Not Go Quietly (A Guide to Living Consciously and Aging Wisely for People Who Weren’t Born Yesterday), by George and Sedena Cappannelli, was given to me by Hay House in exchange for my honest opinion of it. The introduction reveals that over the next decades half our population will be age 50 and older, for the first time in history. This book targets the demographic revolution that is occurring and how we affect in an unprecedented manner the political, social, economic, technological, environmental, and cultural influences. Specific population groups included here are older GenXers (40 to 45), Boomers (46 to 64) and Elders (65 and beyond). These groups are celebrated for having the opportunity, time, talent, resources, and experience to mindfully facilitate this breakthrough that is happening. Well, hey–as I both fit into the target audience and am all for mindfully furthering a direction to a betterment of an outcome, I was all excited to read this book. I have to say I liked the large number of quotes from a variety of very familiar and widely accepted icons in the field. The personal stories of specific people who are wonderful examples of what the authors are encouraging were very uplifting and interesting. I also appreciated what a great overall message the authors had to share of continuing to create a life of quality and accomplishment, especially as we all move into this next beautiful chapter of our lives. There is a lot of very good encouragement and support for who we are, where we’ve been, and where we can still go–on an individual as well as collective level. There were a couple recurring areas of struggle that I had, and so I simply treated these as “to each their own.” Yet it did bog me down a bit in the overall product. Apparently more than a bit, otherwise I wouldn’t feel the need to mention them…. I can get past the recommendation that one of the most valuable and powerful models of living is a commune. I suppose I can also choose to move forward from the repeated recommendation to embrace recreational hallucinogenic drugs in order to expand my spirituality. My spirituality and I are not presently confined, but maybe that’s hard to imagine without pharmaceutical assistance. What the authors perhaps meant as encouraging instead felt divisive. The most challenging aspect for me was that I felt a pervasive agenda throughout the book, when I was expecting spirituality instead. Support for continued contribution, accomplishment, development, and personal growth. Great quotes from recognizable spiritual leaders. Uplifting life-story examples. Ultimately, we readers bring our own selves to the piece–if you are remotely interested in this book I would certainly recommend giving it your time and energy. One Thousand Gifts, by Ann Voskamp, is a beautiful guide to living grace and gratitude in the middle of regular daily life. “A dare to live fullly right where you are”, this book does not pretend a perfect practice–but it delivers a spiritually supported process. Constantly, consistently, with personal failings. Embrace the imperfections, begin again. The journey itself is a lifestyle that will transform and ultimately save you. Download the app and use it as a sharing tool to help expand your shifted view of life. I have no account with Facebook or Twitter, but I use this app for its uplifting quotes that meet me at its window. There is an abundance here to explore, and I learn more every day. May it cradle you as well. This is the neighborhood I want to be in. From the very beginning of Dianne Gray’s suspense thriller and all the way through, I was wonderfully overwhelmed with the feeling of being immersed in a hugely successful action movie! If you are looking for a moviemaking opportunity, I highly encourage you to explore this author and her story The Everything Theory. Luke Canning is a 17-year-old amateur astronomer who, along with a select few others, has discovered a 10th planet returning toward Earth in its 4000+ year revolutionary cycle. Closely tied to this event are the connections of past advanced civilizations, their messages for the present, and how this relates to our future. Understanding the information contained within archaeology, mythology, native tribal cultures, and more becomes crucial to the returning planet’s timing, and multiple entities are chasing Luke and his group across the world to end their lives for it. Oh my gosh, I could not put this thinking person’s thriller down until there was no more to read! Although I hugely enjoyed the digital version, when finished I promptly purchased the print version and added it to our public high school’s library collection. This is a story that needs to reach many people–for its sheer intelligence as well as its literary craftiness. It strongly elevates the reader’s head and heart, and is also a wonderful storytelling experience and example. Again, if you are considering creating a motion picture I implore you to investigate this author and her story. 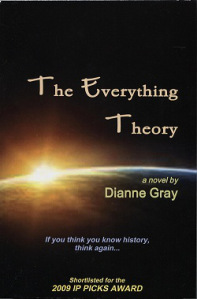 I purchased The Everything Theory by Dianne Gray at Amazon. It can also be purchased elsewhere, including Smashwords. Be sure to visit Dianne Gray at www.diannegray.wordpress.com. I enjoy her blog, and am investigating her other books, too!